Personal Injury - Laceys Solicitors Laceys is a leading, forward-thinking law firm with specialist experts serving both individual and business clients across a broad spectrum of practice areas. There must be an almost infinite number of ways in which a person can suffer personal injury. If you have been injured we offer a free diagnostic interview in which the claim can be discussed and assessed and information given about costs. On some occasions compensation can be claimed for the person or company which has caused the injury, usually if some form of negligence or breach of statutory duty can be proved. In most cases where we take a case on we would strive to achieve a result where the client receives damages free of any deduction or costs to the client are minimal. In our view it is a mistake to instruct claims farmers or solicitors nominated by insurers (often, almost incredibly, by the ‘guilty’ party’s own insurers). Road traffic claims, public law claims and claims against employers which are less than £20,000 are now made through the RTA/public law, employment portal on the internet. If liability is admitted and damages are agreed then the claim is settled through the portal. The solicitor will receive fixed costs which particularly in road traffic cases are not sufficient to cover the solicitor’s costs and we will discuss with the client what the additional costs will be if the client succeeds. There are unlikely to be any costs if a client does not succeed. For more substantial claims or claims which have escaped the portal, if liability is not admitted then the claim will have to be made through the courts. In most cases we take on, liability is admitted and court proceedings do not need to be commenced. Our costs will then be met usually by the other parties insurers. If liability is admitted at an early stage then insurers can be persuaded to pay for medical reports, expert’s reports etc. Interim payments can be obtained to cover loss of wages etc before the case is finally settled. It is important not to settle a case before there is a final medical prognosis. Payments for damages break down into broad categories; damages are paid for pain and suffering, for past and future care costs, for past and future loss of earnings and for other expenses such as damage to clothing, vehicles etc. Damages in this country for pain and suffering are on the low side. In very serious cases the bulk of the claim will be for future care costs and/or loss of earnings. If the other party is not insured then it is important to assess whether that party is able to meet any claim, which may require some investigation such as a search against their address to see if they own their property. Obviously claims against persons who are not insured are more risky in terms of obtaining a payment at the end of the day. 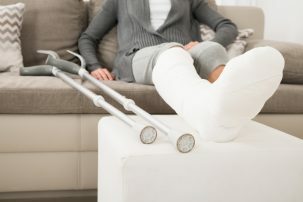 For those who wish to persist in a personal injury claim despite being advised that their prospects of success are not good, one factor which is peculiar to personal injury cases if what is called Qualified One Way Costs Shifting. Essentially this means that if the injured party loses their claim, they will not have to pick up the bill for the other party’s costs at the end of the case, unless they have acted unreasonably. The most important thing in these cases is not the monetary compensation but to try to ensure that the client makes a full recovery. There is now a Protocol with the insurers which means that appropriate physiotherapy and other treatments can be provided free of charge for the applicant where liability is admitted. Obviously it is in the insurer’s interests as well as the client’s to ensure as full a recovery as possible is made. For further advice on any Personal Injury matters please contact Pete Johnson today to see how we can help.